The Hunt For Eagle One: Crash Point is a step up from the first one. The plot this time around is about Al-Qaeda. 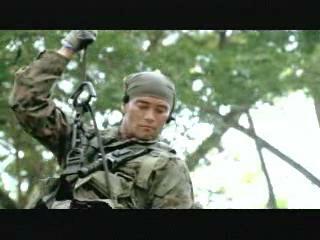 They have a nuclear device and only Lt. Daniels and Jennings (Dacascos and Randle) can stop them. Jeff Fahey plays their Commander. Dacascos gets to use his martial arts skills this time around, as compared to the first one, even when his character can just shoot people. Randle handles the clunky dialogue well. The climactic chase with a helicopter and a bike, while very silly, works on a B-movie level. Fahey just yells a lot, but does a good job at that. Overall, Crash Point is better than the original, and I wouldn't be surprised if they made a third one. Because this is Eagle One Two, it could be called Eagle One Three. Not confusing at all.